View from “Ceremony 1” location on Haleakala. While the mission is still on my mind, and now that I have been “de-zonkified” via rest, a mocha, and fixing a leak in my house water supply hose, I am going to write a few things down, in (approximate) chronological order. So here goes. BTW, all posts about this may be found here and here. About two weeks prior to 4-22, Got the “movement” to go to Maui on 4-22-19, which was an 8 3 day, or an “11” day… very new beginnings (see this earlier post about that). Something about assisting in bringing in and/or opening the Haleakala portal (stargate) to prepare for the next planetary phase of awakening. This was going to be a 3 day, 2 night trip. On the flight over from Kona, flew by North side of Maui, and viewed several waterfalls, some with multiple falls. First time I’d every seen that (and several others in the plane had their faces in their iPhones and I’m sure did not see them). Very challenging arrival energies; had difficulty getting rental car, long line, first car (dark gray) did not work properly, second one was fine (color = silver). First stop felt like ‘Iao Valley, and connect with the “water energies” there (very unlike prior Maui missions, where I’d go straight to Haleakala), in the mists and the ‘Iao river. Connected with those energies, and then drove on. Haleakala journey: it became clear I was to stop at 3 locations on the mountain for ceremony. These were connected with a type of “shaping/configuring the vortex” on Haleakala (see this video). “Slept” on Haleakala overnight (“slept” means “almost no sleeping was accomplished”). Woke up and went to Sip Me Makawao for a morning mocha. Drove over to Kihei to find a beach. Went in water and enjoyed a swim, and visited another coffee place. But energies were beginning to feel intense; felt like I was being “pushed out”. When went back to ‘Iao (water connection) again, and it became very clear the body felt very tired did not want another night sleeping in the car, and that my time on Maui was done. So called Mokulele and rescheduled my flight to leave that day (4-23-19). Flew back to Kona, and zonked out for >12 hours. “At a specific moment in Our conversation [with a friend] I heard “release”….and I thought, wow something Just shifted. I also was told to let you know that. So the “water connection” I experienced by seeing all of the Maui waterfalls on the way over to Maui, certainly connects to this message. Also, a very special Light Worker Galactic person I know was working with the waters of the Mediterranean at the same time I was on Maui. Very important connection there. The only message received about this was, “Greece aligned.. Done”. Aloha KP – I live on Kauai and last night I felt a galactic pulse of energy, transforming everything. I attend a Sunday evening mediation group – but this was very different than usual. I got the message ‘there is no going back’ after this pulse purified earth. So all of these things connect with what happened on Maui. And it appears that a TONNE of Clarifying-Illuminating Light energy was released, via the water connections, and topped off with the ceremonies on Haleakala. We’ll see where all of this goes. Mahalo to all who connected, in their own way. A new video by And We Know (Bitchute channel) covering the latest recent SB2 post, the link for which I posted here. This goes into much of the history of the Notre Dame cathedral, and how the fire was started by the Alliance to derail a planned “blood sacrifice” event at the cathedral, which was then moved to Sri Lanka. Some may be interested in seeing how Macron is being “displayed” as a puppet to his masters, in the video, Emmanuel Macron dans les CRIF du diable (“Emmanuel Macron in the Devil’s CRIFs” (CRIF = Conseil Représentatif des Institutions juives de France (Representative Council of French Jewish Institutions))). Excellent video, again, by And We Know. Although the image I use is with a “brightly lit and inspired” face, there are times that I don’t feel that way. My body was extremely drained (zonked) after (and during) this trip and after returning I really haven’t been highly “emotion stable”. So I’m not “3D perfect”. So there. There’s still a coqui frog right overhead in my kitchen and it is so loud (from 6PM to midnight – 2AM) I have to wear headphones plugged into my Roku remote to hear what’s playing. I definitely felt the “PO’d as hell” emotions about that, as I had just gone out earlier, when it started chirping, climbed up a ladder, and threw baking soda powder on the spot on the roof I thought it was. No difference at all. Still chirping. CRAP!!! I’m not going to try to bring in a “spiritual connection” with all this, and be “sane and spiritually balanced” about it. Hell with that! But I know these things “coming up” emotionally hold a message. This could be another message that it is coming time to move… physically. We’ll see where that goes. I may begin at least looking for another place. Not sure where that would be. I’m still enjoying Big Island, but even something about that feels “ended”. I did not really feel drawn to Maui (for living) this time; Kihei felt like a tourist zoo, and it (and Maui in general) just didn’t feel like my “place to move to”. All these things could change. This period of time still feels like a “completion phase”, and like it is the end of that phase… for myself and many others. Bottom line now is that I don’t know what I’m doing, and I don’t know where I’m going. So that’s where I will leave this. Thank you all for just reading and listening to my occasional e-rants and blowing off some emotional steam. Click to view list of individual videos. Please note that in the “Message from a Beach” video, Kaho’olawe (not Lanai, as mentioned in the video) is in the background. I read this while on Maui and found it unveils a lot about the recent die there. Full weekly report from Ben. “The sacrificial burning of Notre Dame Cathedral to Molech (Ba’al, Set, Satan) was a desperate attempt by superstitious EU Khazarian satanists to somehow reverse their fortunes, P2 Freemason sources say… “Notre Dame” or “Our Lady,”… refers to Mary. Mary, of course, is the Christian name for the Goddess Isis… It is for this same superstitious reason that these satanists created a horrific terror organization and tried to call in ISIS in order to weaken support for the Goddess in the minds of humanity. “…according to multiple sources in the French Yellow Vest resistance, the burning of the Cathedral is being blamed on Macron and his German puppet masters. “Certainly a critical mass of aware people, especially in the world’s military and intelligence agencies, know that the “Islamic State” really refers to the Satanic State, i.e. Israel. So when the “Islamic State” takes credit for the massacre of Christians in Sri Lanka and elsewhere, the real culprit, Israel, is pinpointed. ““A 21st century holy war or crusade against the Jews [Khazarian Mafia] will be led by Russia, the EU, and the USA to defend Christendom, aided by Muslims,” the Pentagon sources predict. “As these events show, the battle against the satanic Khazarian mafia is raging in a way that transcends traditional political, religious, and geographic boundaries. “Presumably the Zionists are hoping that by providing Russia with the crown jewel of U.S. military stealth technology via North Korea, they will also be hoping to get protection for Israel. Russian FSB sources, however, have long said they will not protect the state created by the same satanists who killed many tens of millions of Russians during the 20th century. “This battle for the planet Earth is also unfolding in Indonesia, where much of the world’s gold is supposed to be located. Here, a hotly disputed general election has just taken place. CIA sources in Indonesia are saying that Khazarian-backed Prabowo Subianto, along with his photogenic vice-presidential candidate Sandiaga Uno, actually beat the incumbent Jokowi. “Control of Indonesia is a matter of life and death for the Western powers, because control of the gold and treasure located there will be hugely important when the inevitable reset of the global financial system takes place. “The only reason the U.S. has not been formally bankrupted is because it would cause World War III. However, under the current financial system, the more time that passes, the weaker the U.S. international position becomes. “The Chinese have upped the pressure recently by starting an investigation of the company, based on the excuse that a brand new Mercedes Benz broke down immediately after it was purchased. Japanese military intelligence say this is an opening gambit in a big move against Germany by the Chinese. …the North Koreans by the Zionists [Khazarian mafia]” for a huge sum of money. North Korean strongman Kim Jong-un will be taking this fighter as a souvenir and bargaining chip when he visits Russian President Vladimir Putin at the end of this month. Presumably the Zionists are hoping that by providing Russia with the crown jewel of U.S. military stealth technology via North Korea, they will also be hoping to get protection for Israel. Russian FSB sources, however, have long said they will not protect the state created by the same satanists who killed many tens of millions of Russians during the 20th century. The fact that Kim is planning to visit Russia just before the new Japanese Emperor Naruhito officially takes the throne on May 1st is also a sign that he is seeking some sort of protection, say Japanese right-wing sources close to the Emperor. That’s because North Korea helped with the Fukushima mass murder attack against Japan and fears retaliation from the new Emperor. The North Koreans helped with Fukushima in exchange for promises from the satanic Khazarian Rothschild family (Rothschild means “red shield,” a symbol of Satan). The Rothschilds said they would move 40 million Japanese from Tokyo to North Korea and make North Korea the Rothschilds’ Asian headquarters, according to a member of the Rothschild family. Then Japanese Prime Minister Naoto Kan has publicly confirmed he was pressured to evacuate 40 million people from greater Tokyo after the Fukushima attack. This battle for the planet Earth is also unfolding in Indonesia, where much of the world’s gold is supposed to be located. Here, a hotly disputed general election has just taken place. CIA sources in Indonesia are saying that Khazarian-backed Prabowo Subianto, along with his photogenic vice-presidential candidate Sandiaga Uno, actually beat the incumbent Jokowi. 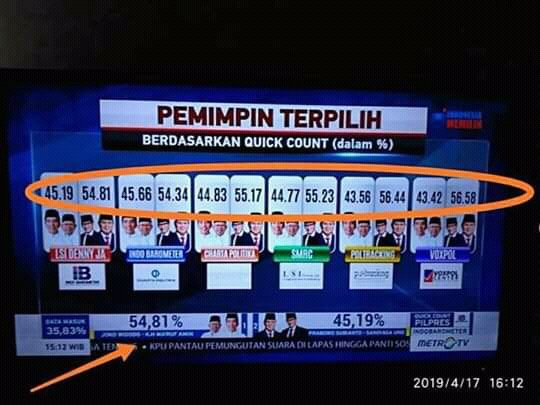 They offered as proof this screen shot from Indonesian TV showing contradictory results. “There is a serious battle for control of the country going on behind the scenes. Prabowo/Uno actually won by 60% ±. This has been verified by numerous inside sources. [Chinese-backed] Jokowi/Amin humbly say that they won. The media is spinning a Jokowi win. We shall find out. There are Real Deals being offered behind the curtain. “Prabowo has publicly said that he will curtail China’s takeover of the infrastructure of Indonesia. The official vote counting will be announced on 22 May. Control of Indonesia is a matter of life and death for the Western powers, because control of the gold and treasure located there will be hugely important when the inevitable reset of the global financial system takes place. We say it’s inevitable because unless the West resets the system, it will become a one-China world. The U.S. has a cumulative trade deficit of around $15 trillion. This means foreigners, mainly Chinese and Japanese, control an amount of U.S. dollars that is almost equal to the U.S. GDP. This is why China can woo the world with its trillion-dollar Belt and Road Initiative (BRI) and the West cannot afford to offer anything remotely similar in scale. The only reason the U.S. has not been formally bankrupted is because it would cause World War III. However, under the current financial system, the more time that passes, the weaker the U.S. international position becomes. Also, China has major control over the EU because of its EU 1.777 trillion deficit (U.S. $1.998 trillion) that has accumulated since the Lehman crisis of 2008. Already, 16 Eastern European nations have joined the Chinese BRI initiative and now Greece, Italy, and Switzerland have hopped on the bandwagon. France, the UK, and Germany are the only major European nations holding out. Since the EU does not have the U.S. military option, they are in a much weaker position. Asian secret society sources are saying China is telling the EU they do not want any more paper (EU debt instruments). Instead, the Chinese are pressuring the Germans by asking for control of industrial jewels like Daimler Benz and financial powerhouses like Deutsche Bank, the sources say. The Chinese, who already own Volvo and 9.69% of Daimler Benz, now want more, they say. The Chinese have upped the pressure recently by starting an investigation of the company, based on the excuse that a brand new Mercedes Benz broke down immediately after it was purchased. Japanese military intelligence say this is an opening gambit in a big move against Germany by the Chinese. This is probably the real reason why Germany is now publicly saying it wants its own fleet of nuclear bombers. The West needs to hurry up and remove the satanic parasites from its body politic so that it can present a united front in negotiating a new financial system with the Asians. It also needs to woo Russia back onto its side. The fact that President Donald Trump congratulated Russia-supported Ukrainian President-elect Vladimir Zelensky is a clear indication that the destructive Western “blame everything on Russia” campaign has ended. Only if the EU, Russia, and North America present a united front can they hope to negotiate with Asia from a position of strength during important meetings in the coming weeks and months that could decide the planet’s future. Holy Crap!! 190413 1709 HST… Just had a 5.2 earthquake near where I live!! Cosmic Waves… 4-12-19… On the ocean for the second day with dolphins… Tonnes of them! Cosmic Waves…Standing “O” for Corey!